I should note that the save difficulty number here, because I want an aggregate over all their shots, counts off-target shots as a save difficulty on zero. The raw number obviously averages out roughly to the global conversion rate of on-target shots (around 30%). So, we can see some players increase the average difficulty of their shots for keepers, others make them easier. I’ve calculated both the ratio (i.e. Juan Mata increases his shots’ difficulty by 1.5x), and the difference, (i.e. Juan Mata increased his shot quality of around 10% to a save difficulty of around 15%). To the right are better chances, top the top are better shots. You can see examples like Olivier Giroud and Sergio Agüero, who are making already quite good chances even scarier, Ross Barkley’s making bad chances look very slightly more exciting, and Jason Puncheon and Troy Deeney just need to stop. Steven Gerrard’s numbers here are padded a bit by penalties, but he took good penalties, so you can see the boost he gets. Costa was a monster, Nacer Chadli was incredibly sharp (though seems to have crashed hard this season, basically halving the xG on every shot). Ross Barkley’s chances were just as bad, but unlike this year, they didn’t go in. Jason Puncheon just needs to stop. While it’s clear we haven’t found the holy gail of a strongly repeatable shooting metric, I still like our composite model. 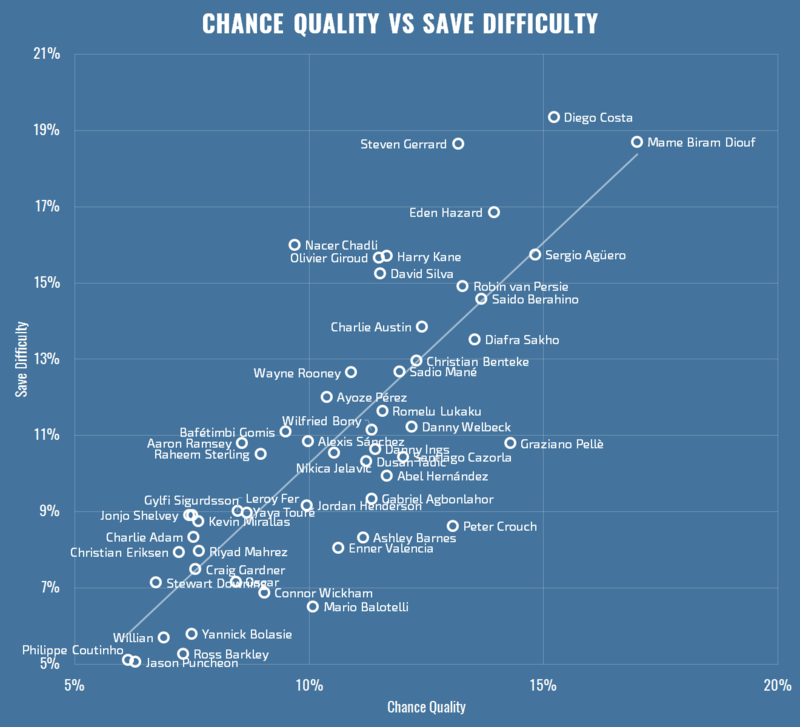 It has the benefit that as my chance quality and save difficulty models get better, these numbers may also improve, and I’ll be sure to look into that. At the very least, I think the idea of having small, granular models, and looking at the gaps between them is an interesting way to find some new metrics and insights, and I’ll see what else I can find with a similar approach. I’ve ordered by saves above expected because it’s a more in your face than the rating. It’ll be interesting to see who goes to Euro 2016 for England, Jack Butland and Alex McCarthy are both making a good case early in the season. That said, Alex McCarthy has faced the easiest shots on average of any keeper in the league (save Michel Vorm, who has had only one save to make). Hugo Lloris is performing above xS, but not so much that Tottenham’s 5 goals conceded is overly flattering. Lloris is another that’s right down there in the difficulty stakes, and it’ll be interesting to analyse over the coming weeks whether this is tame shot-making, or defensive organisation. The Brad Guzan vs Marrten Stekelenburg comparison at the bottom is fascinating – imagine if Southampton allowed as many shots as Aston Villa. It’s early in the season, and saves are easier to make than goals (I’m not saying goalkeepers are the bassists of football, just that they save more than they let in, and strikers miss more than they score), so as you’d expect, the model matches reality fairly well so far. 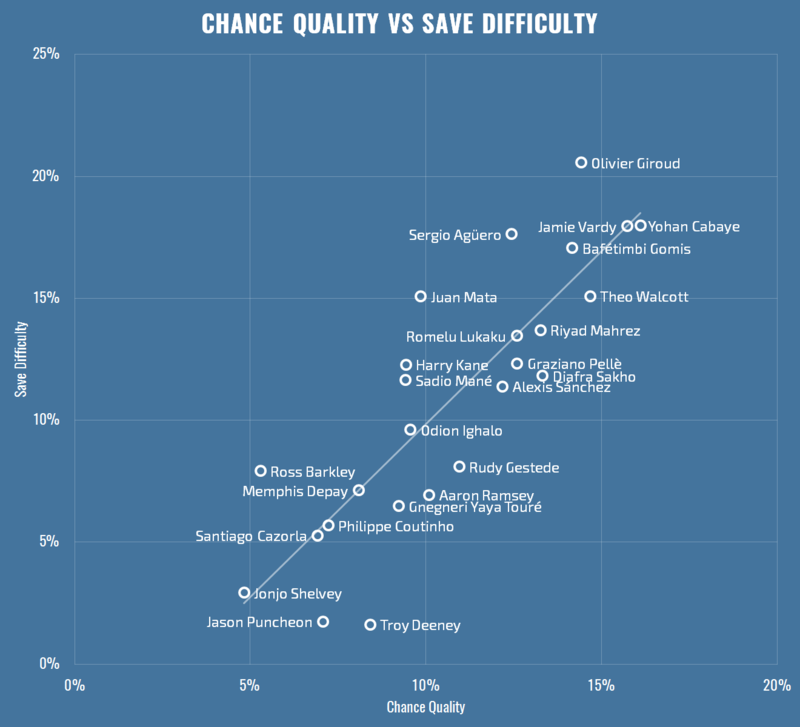 We can see this if plot expected saves versus saves – above the line is good, below is bad, further to the top right are the leakiest defences, bottom left are mostly backup, although Darren Randolph and Sergio Romero seem to have done fine when called upon this year.